Help a distraught wife find a famous painter who has gone missing. Listen to rumors in Cheydinhal about the missing painter, and meet his wife, Tivela, in their house. Tivela tells you about her husband locking himself in his room; go to his room, and enter the painting. Find Rythe and he tells you about a thief who stole his magic paintbrush. Find the thief's corpse and retrieve the paintbrush. Return to Rythe with the brush and you will both return to Tamriel. He will reward you with the Apron of Adroitness. If you ask around town in Cheydinhal, people will tell you that Rythe Lythandas, a famous painter, has gone missing, and his wife, Tivela, is very upset. Go to the Lythandas house on the south side of town, and talk to Tivela for more information. Tivela tells you that Rythe had locked himself in his study, as he often did. However, after not seeing him for several days, Tivela decided to investigate. Upon doing so, she discovers that Rythe has disappeared. Tivela gives you the key to Rythe's study. Open the door and take a look around. You should notice fairly quickly that one of the paintings is actually a door. Enter the painting. You soon arrive in a painted semblance of the great forest, and Rythe is standing near you. He reveals that a thief stole his magical paintbrush, which allows him to enter paintings to make them look more realistic. The thief created some painted trolls to guard him, but instead they killed him. Rythe needs the paintbrush so that both of you can escape. If you ask him about the painted trolls, he gives you six bottles of turpentine, which do a level dependent amount of damage (see chart below) to painted trolls when applied to your weapon. There are at least six painted trolls that tend to be hard to kill. Two applications of turpentine generally kill one painted troll, but depending on your level you may need up to four (see the table below.) Fire damage works similarly on painted trolls as on standard trolls. 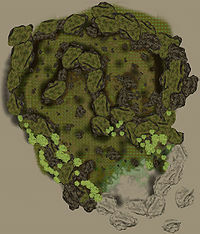 The trolls also cannot jump or climb, so rocks can provide a safe haven for your character during battle. However, they are fast, and you will generally not outrun one for long. 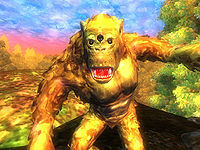 Each troll also has painted troll fat, a unique ingredient with different properties than regular troll fat. This quest is the only place in Oblivion where you can get it, and it can not be duplicated in the Enchanted Chest. Therefore, you may want to kill as many painted trolls here as you can find. You can evade most of the trolls if, instead of following the path, you travel south and a bit west over the rocks from where you start. You will still have to kill the one or two trolls closest to the thief's corpse, but with six bottles of turpentine, this shouldn't be a problem. You can also lure them to Lythandas, who, although weak, is essential and will not die. 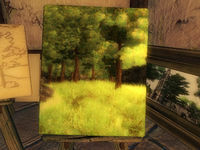 After looting the thief's corpse and returning the brush to Rythe, he paints a portal back to Tamriel. When you arrive, stick around and listen to the conversation he has with his wife. Afterwards, he'll give you the Apron of Adroitness, a light armor chest piece with a leveled agility and intelligence boost. If you do this quest early and want to wait for better gear, you should leave while Rythe and Tivela are still talking. Come back later to receive your now higher-level apron. This works because the apron level is determined the moment you receive it from Rythe. There seem to be several "sweet spots" for the best level to do this quest. Both the Trolls and the Turpentines are leveled, but the Turpentines only increase in damage every 4 levels, while the Trolls increase every level, so if you do the quest at either level 1 or a multiple of 4, you will do optimal damage with the Turpentine. Level 1 is clearly the best time to do this quest as seen from the chart below. Turpentines do not increase in damage after level 20 so it will only get harder after that. This chart does not take into account the damage from the weapon you use to deliver the poison. Oddly, the body when you find it is labeled as "Bosmer Thief", and Lythandas notes multiple times that the thief is Bosmer. However, a closer inspection reveals that the body is actually that of an Altmer. The name in the Construction Set is "Senannala," which sounds slightly more like an Altmer name than Bosmer, though Bosmer and Altmer names are often similar. After you complete this quest, a special edition of the Black Horse Courier is published: "Greatest Painter Safe!". After completing the quest, the Lythandases may consider you to be trespassing (although, as you've just completed a quest for them, their disposition should be high enough for you just to yield to them). If you are considered trespassing after returning from the painting, Rythe may not talk to his wife. Talk to him for the reward. Occasionally upon entering the Painted World, Rythe does not converse with you about the thief and stolen paintbrush. The painted trolls are active, and you can kill them, but there is no thief or paintbrush to be found. In this case, save and reload the game, then approach Rythe. This should cause the quest to progress as usual. Alternatively, return to the spot where you first entered the Painted World and wait a second or two. This should trigger the appropriate quest update and cause Rythe to speak to you. After returning the paintbrush to Rythe, sometimes the door he paints for you to return to Tamriel will not be visible or cannot be used. Try to pickpocket Rythe (he must catch you) before he begins painting. Another solution is to hit Rythe and then immediately yield. Don't worry, the crime will not be reported and there is no bounty since no guards are around to witness the crime. This does not affect Rythe's disposition towards you because it will be set to the max upon leaving the painting. You can also try using the console command setstage MS14 75 and then using the console to exit the Painted World (e.g., "coc CheydinhalAbandonedHouse"). The quest should continue as normal when you return to his house. If you kill Tivela before she has given you Rythe's Studio key, you may never continue further in this quest. You can get the key by using player.additem 0001bc2c 1 in the console to gain access to the study. If you interact with Rythe while he is forming the portal, he might never make it. He stops and stands at the same spot forever, saying it's not the time to talk. Reloading from a previous save is needed. However, if you manage to yield to Rythe before he himself decides to stop attacking, he will make the portal. After completing the quest, Tivela will incorrectly refer to male characters as "muthsera", a term which is meant to refer to females. Upon completion of the quest, and Rythe returning to the community, his rumor option will still be that of his wife looking for him, and being sick over it. 10 I've heard that a famous painter named Rythe Lythandas has gone missing. Apparently, his wife Tivela has been frantically searching for him. Perhaps I should visit their home here in Cheydinhal to see if I can assist with the search. 20 I've met a kindly Dunmer named Tivela Lythandas. It seems that her husband, Rythe, has gone missing. She seems extremely distraught, so perhaps I should talk to her to find out more information. 30 Tivela told me that Rythe had been locked in his studio to work on his latest painting. He usually comes out to eat and sleep, but hadn't done so for more than a day. When she went in to investigate, he was gone. The odd thing was that the study door was still locked. Tivela gave me the key to Rythe's study. If I intend to find him, that's where I should start. 35 I've declined to help Tivela locate her husband, but she said she'd be here if I change my mind. 38 I've reconsidered and decided to help Tivela locate Rythe. She gave me the key to his studio. If I intend to find her husband, that would be the best place to start. 40 After touching the painting Rythe had been working on, I suddenly found myself standing in a strange forest. 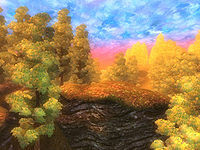 It looks familiar, like the Great Forest in the heart of Cyrodiil, but something is different about it. 50 I've located Rythe Lythandas. He was standing in this strange forest, seemingly waiting for someone to rescue him. He blames his predicament on a thief. I should continue speaking with Rythe to find out more. 55 I've learned that a thief broke into Rythe's studio and stole his Brush of Truepaint. Using the artifact, he escaped into the painting. He then painted trolls to protect himself, but they turned on their creator and killed him. Now the Brush is on the thief's body, and we can't leave without it. I should take my leave of Rythe for now and begin exploring this surreal forest. 60 I've located the thief's corpse. I should now search it for the Brush of Truepaint. 70 I've retrieved the Brush of Truepaint. I should go back and return it to Rythe, so together we can leave this strange landscape. 72 I've given the Brush of Truepaint to Rythe. He said he could paint an exit and beckoned me to follow him. I should do so. 75 Rythe used the Brush of Truepaint to paint a door back to his studio. I should now step through and return back to Tamriel. 80 We've arrived back in Rythe's home. The painting is now sealed, and Rythe is safe. I should speak to him when I have a moment. 100 Yes As a reward for getting him home safely with the Brush of Truepaint, Rythe presented me with a fitting reward; his Apron of Adroitness. 200 Yes One of the characters needed to complete this quest has died. It is possible to use the console to advance through the quest by entering setstage MS14 stage, where stage is the number of the stage you wish to complete. It is not possible to un-complete (i.e. go back) quest stages. See SetStage for more information.